More values are allowed within one OSC packet. New designed laser system with enhanced functionality available. New function "Effect Pool Manager": Enables to copy entries from one trickfilm to another one with drag and drop. Following comprehensive redesign of the prototype PHAENON Accurate LaserAnimation can now offer the first full color laser projector which uses the new revolutionary IEEE 802.1 AVB standard for streaming of laser images via LAN. Managing Director M. Sollinger: "We think this will change the way laser shows are produced, stored and operated. Laser display data is treated in the same way as audio data i.e. laser images can be used like samples and modified in terms of size and color. We hope this will open laser to a much wider range of artists, since no special laser show programming knowledge is necessary." 1st place for the light art and laser performance "Deep Web"
3rd place for the laser show "Empire State of Mind"
The LoopCnt window now displays the absolute time. New trickfilm command to limit the frame rate available. In connection with the new release of "LGRemote" an adaption of the desktop resolution of the Lasergraph DSP to the screen resolution of the PC is possible now. New Free Show Named "Fernweh"
The current level of 706 integrated Taipan laser modules would achieve a cumulative laser power of 3,816.5 Watt! Support of this project by providing special laser systems named "PHAENON Rainbow"
At the start of this year's project the laser units beamed the colors of the rainbow into the evening sky over Berlin from 27 to 30 April 2016. The new Lasergraph DSP system software release introduces new color settings for a more modern appearance of the Lasergraph DSP. For this dark colors were used which are rich in contrast nonetheless, making working in low ambience lighting much more comfortable. The user can now choose from four different new color settings, "Carbon" (Standard), "Basbon", "Carbots" and "Darklux". Further improvments → Release Notes! The world premiere of Deep Web from February 2nd to 7th 2016 as part of the CTM festival was an overwhelming success, mainly for lighting artist Christopher Bauder and composer Robert Henke, but also for the different teams which supported and accompanied this installation. A matrix of 175 lit spheres hanging on motorized winches as well as the beams from 12 installed high-power laser projectors formed a structure of lines and dots hovering in space with ever changing colors and movements. The laser-lit spheres moved in synchronous choreography with the composition (8 channel surround sound) by Robert Henke. To make realizing setups with multiple Lasergraph DSP more affordable the Lasergraph DSP Playback is now available. This is a non-editable version which will turn into a full-fledged Lasergraph DSP as soon as a Lasergraph DSP with the new Licensor feature is present in the network. output quality. Installed in the tried and tested DSP compact housing it features all necessary interfaces for integrating other event- and stage devices in addition to the laser projector (ILDA, DMX, SMPTE, MIDI, RS232, RS485, Sync, LAN). When the Playback is connected to a network which contains a Lasergraph DSP Mark 2 Licensor it immediately becomes a fully editable Lasergraph DSP. The Licensor generates a temporary editing license for the Playback as long as the network connection exists. This licensing mechanism is completely automated in a local network with hundreds of DSP Playback platforms and any Lasergraph DSP Mark 2 Licensor. No user input is necessary! The price for one Lasergraph DSP Playback is 2190 EUR. The PCB for integration into a laser projector is even more advantageous. The new software level Mark 2 Licensor is available for all Lasergraph DSP hardware platforms (compact + PCB, compact dual, travel and workstation). It can also be installed on existing systems through an upgrade. Please ask your dealer about the relevant conditions! Classical beam show "Adventures" for multiple projectors. Numerous requests of DSP users have been implemented in this release, e. g.
The compatibility to Windows Vista/7/8/10 has been improved and small bugs have been fixed. All programs of the DSP Production Suite have been successfully checked for compatibility to Windows 10. Comprehensive collection of all examples for the Trickfilm commands updated. This projector was designed for laser applications without elaborate installation. With its handy design it is perfect for mobile use, e.g. for exhibitions which are presented in different locations in a short period of time. High value 5.5W RGB laser module which is developed and manufactured by LaserAnimation. LaserAnimation has presented the prototype of this newly developed RGB laser projector at the Prolight & Sound in Frankfurt a. Main. Using our compact red and blue laser modules it is now possible to combine the inner components more efficiently and to integrate the whole projector into a smaller housing. With the smaller dimensions the weight is also reduced, making the laser projector more comfortable to use. DMXOut() is used to control one channel of the DMX output and the similar function DMXOut16() which combines two consecutive channels into one 16-bit channel. wysiwyg is an award-winning lighting design software created by CAST Software Ltd. from Canada. It allows a highly realistic visualization of a complete stage design for show productions. An important feature of the new software release wysiwyg R34 is the integration of laser visualization. The latest versions of LpvPlayer and LpvCreator already contain the wysiwyg support. The Lasergraph DSP software will support wysiwyg with the next release. First place in the category "Innovative Application" during the 2014 ILDA Conference. Adjustable Softblanking parameter inside the Modifier Stack. Every object can now have a different softblanking attribute. Adjustable "Black Threshold" in the proTize parameter. Beside some internal changes we added the menu "IP configuration" feature (main menu tab "Setup" ) to make it easier to change IP and Subnet from inside the GoboWizard. Berlin Leuchtet: Europacenter, Siegesäule, Dom Aquareé, Shopping center "Galaria Kaufhof"
Different test patterns can now be selected: In addition to the known DSP test pattern the pictures within the catalog "Testpattern.CATL" can be used. New command "Find" opens the selection list for timescript commands. Restriction of the movement in the DGC was enhanced. All functions and parameters / diagnosis of multiple laser projectors can now be controlled by one "LA Toolbox" via ethernet. The laser output for all connected laser devices is switched off immediately when clicking the “Disable All” button. 3. Support for Art Project "Destructive Observation Field"
Laser in a new Dimension - performed by the artist R. Henke. This impressive multicolor laser installation was shown in Lille (France) and Berlin. Robert Henke choose the PHAENON X Pro with orange laser source. If you have several laser projectors in one installation you may want to use just one E-stop. The spectacular multimedia project "Wings of Time" was realized by the French Company ECA2 on the small Sentosa island, a leisure paradise 10 km south of Singapore. Four of our high-end PHAENON X as well as four of our successful BLITZ laser projectors provide the necessary laser power - 90 W in total. The laser was wonderfully designed by our friend Claude Lifante. The new function "Laser Disable" offers a simple way to activate resp. deactivate the laser output on one or more Lasergraph DSP Mark 2 from one or more positions. In addition the Lasergraph DSP Mark 2 can be combined into groups and if necessary these groups can be turned on or off independent of each other. For operation there is the new software "Laser Disable", which runs under Windows or Mac OSX. Support for visualization software "Realizzer 3D"
LaserAnimation presents a new hardware platform of its legendary Lasergraph DSP series, the Lasergraph DSP travel. This laser show controller offers full performance at a much smaller volume, because the new design makes it possible to integrate a complete Lasergraph DSP compact Mark 2 into a small lightweight ABS Polymer housing. LaserAnimation supported a spectacular laser project by providing the necessary laser technology on the occasion of the CES 2014 (Consumer Electronics Show) in Las Vegas. BLIZZARD laser projectors installed during premiere of "Lumière I"
After an intensive development process and a comprehensive test phase we are proud to present ShowLine, the long awaited timeline application for the Lasergraph DSP Mark 2. The software makes arranging laser effects with audio or video files simple and clear. 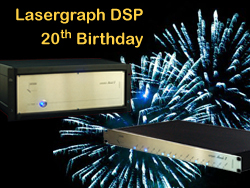 All entries of a Lasergraph DSP show can be integrated into the time axis and synchronized with an audio- or video file. On the evening of October 9th 2013 for the opening of this year's "Festival of Lights" the special concert LUMISSIMO had its premiere in the Berliner Dom at the Lustgarten. The audience witnessed a wonderful symbiosis of music, laser and light. One highlight of the concert was the combination of a laser harp with the great Sauer organ with organ works by Johann Sebastian Bach. The LGServer has been enhanced with the File System Server. Its setup is configured analogous to the "File System Server Setup" on the Lasergraph DSP. (Compare picture - click to enlagre). The File System Server can always be used if the access to the Windows shares is too complicated or not possible for any reasons. Feature an enhancement of the "ScriptButtons" with new as well as supplemented commands which allow e. g. the creation of a toolbar or other individually designed interfaces. The current software version makes it possible to create "ScriptButtons" (grafical symbols) with the Lasergraph DSP Mark 2. These ScriptButtons allow to enhance the existing graphic user interface (GUI) of the DSP by adding more buttons or to create completely new interfaces for special applications. The WIFI version of the LA Toolbox program is available free of charge in the Apple App Store. All laser projectors of the PHAENON X series can now be controlled using an iPhone or an iPod touch. It is now possible to use the LA Toolbox on a Apple Mac computer. PHAENON X laser projectors as well as the "Basic" models BLITZ, BLIZZARD and PHAENON Basic can now be controlled using a PC or a Mac. Features characteristic line correction for the individual laser lines - allows a significant improvement in the color behavior and thereby the whole picture output. LaserAnimation Participated in Art Project "FLUIDIC - Sculpture in Motion for Hyundai's Advanced Design Center"
Between April 9 and 14, 2013 the art installation „FLUIDIC – Sculpture In Motion“ was displayed in the Temporary Museum for New Design in Milan. The installation was designed and produced by Berlin based design studio WHITEvoid for Hyundai’s Advanced Design Center. In cooperation with WHITEvoid LaserAnimation had participated in development, installation and performance of this project. Additional our company provided eight dual color laser projectors BLIZZARD each with integrated laser show controller Lasergraph DSP Mark 2 for the artwork. It can be controlled using the "LA Toolbox" Software - allowing an easy and comfortable adjustment of the beam superposition. This is a big advantage of the new PHAENON X projectors which users will certainly appreciate. The position of the individual beams can change over time when the projectors are frequently transported, set up and taken down again. Until now the beams could only be adjusted using the small adjustment screws on the side of the device. In everyday use the projectors are often already installed in a stage setup, e.g. attached to a truss high up, when the laser is turned on and the beam misalignment is discovered. This used to mean the laser had to be taken down again for adjustment. This considerable effort is no longer necessary using the "Beam Adjust" of the LA Toolbox Software. Next Generation PHAENON X - Convincing Innovation! With the wide range of outstanding "all in one" full color laser projectors of the PHAENON series LaserAnimation has been present on the full color laser system market for many years. The new generation PHAENON X now offers many new features and enhancements, e.g. New powerful red as well as blue laser diode modules allow higher laser output power. First version proTizeConverterDSP--2012-12-04.dmg can be installed under Mac OS X 10.6 or later. Can be used on Apple Macintosh OS X as well as on PCs with Windows. Offers a well-arranged user interface which allows three-dimensionally displaying of all elements used for a stage production in real-time. Lpv Player dated 2012-11-22 with function 'Send NetTimecode' which makes it possible to send the current timecode as Net-Timecode over the network. Our Russian distributor Laserkinetics implemented a spectacular laser installation in the far-east town of Vladivostok using BLITZ laser projectors integrated into special outdoor boxes. Many DSP users have been awaiting this news desperately! It is now possible to program and edit DSP laser shows on a Apple Mac computer with LGRemote. Additionally there is a special Mac version of LGTimecode available. Lasergraph DSP Mark 2 Supports "Depence V:3D"
The new Lasergraph DSP software version dated 2012-08-17 now supports the visualization software "Depence V:3D Visualizer" of Syncronorm. The Lpv Creator can now be used as source for the visualization software LightConverse. Using the new function "Send NetTimecode" it is possible to send the current timecode as Net-Timecode over the network. 400 integrated laser diodes would achieve a cumulative laser power of 2048,5 Watt ! 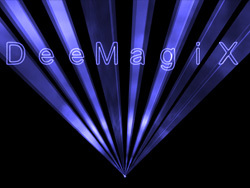 DeeMagiX allows to control extraordinary laser effects with a connected DMX lighting console. 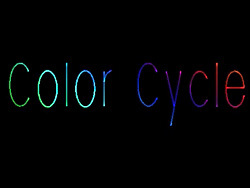 ApplyColorCycle allows simple creation of fantastic color effects. CycleBeamColor offers a simple way to color scan beams and to realize beam chases. 2. 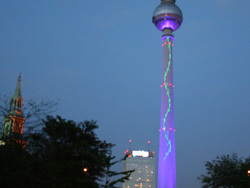 LaserAnimation During "Festival of Lights"
Spectacular laser projections on the "Fernsehturm" (TV tower) in Berlin - the TV tower as "Lightsaber"
Development, manufacturer and states of laser systems for event and scientific technical purposes. With the new Trickfilm command "SetBeamColor" e. g. color transitions between two colors can easily be realized. The OSC (Open Sound Control) support has been enhanced. 1. 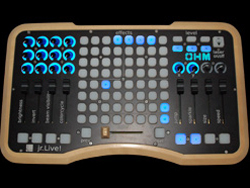 New Accessory for Lasergraph DSP: Midi Controller "Ohm64"
The OHM64 is a Midi controller for comfortably controlling effects and parameters of the live mode in the "jr. Live! " Of course the controller can also be used to control other shows on the DSP. 2. PHAENON RGB Projections On "Realhorns"
At the Traunreuter Lichternacht (night of lights) event in September 2011 the spectacular horns will be used for laser projections. Coherent celebrated the occasion of the shipment of the 1000th Taipan laser by awarding the best selling integrators with a special Taipan unit. 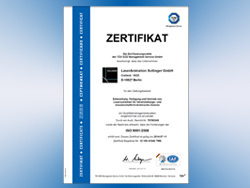 LaserAnimation Sollinger GmbH sold almost 300 Taipan lasers and received the " 250+units " award. Peter Vogt and Arnaud Lepert of Coherent handed the award to Mr. Sollinger. 1. DSP Software With License For Sms2Dsp! Sms2Dsp! is a comfortable program for communication between a cell phone and a Lasergraph DSP. A sent message from the cell will be displayed as laser projection within few seconds. The new designed modular concept for this projector series allows even now the integration of all PHAENON RGB 5500 components including grating module as well as Lasergraph DSP PCB into the well-proven and very handy "Basic" enclosure. The new Release dated 2011-01-12 supports addional to the previous versions the recent versions 2010 and 2011 of 3ds Max. High-Power Laser Projector "PHAENON RYGB 15500" completes the ultra-compact systems of the well-known PHAENON RGB series.